Who knew my hand painted chocolate portrait of La La Land will be displayed next to such esteemed company....Thank you Joelle for carrying this piece of chocolate to LA to celebrate your son Fred's success. I feel so privileged to be a part of this celebration. La La Land might not have received the Best Picture award last night at the 89th Academy Awards, but in my mind, the whole cast and crew's gracious conceding to the confusion was a testament of who you are. Kudos to all of you for bagging 6 Oscars. Le Rouge is proud to partner with chefs from The Spread, The Pearl at Longshore, Nom Eez, Rothbard's & Vespa for Fairfield County's first ever "Kitchen Crawl", a culinary tour to benefit Community Plates. We will create desserts to pair specially with each chef's unique menu. Purchase Tickets to Kitchen Crawl here. Note: Ticket sales will be limited. ALL proceeds go directly Community Plates' mission to end American food insecurity by directly transferring fresh, usable food that would have otherwise been thrown away from restaurants, markets and other food industry sources to food insecure families throughout the U.S.
One of the most satisfying experiences since opening Le Rouge Chocolates has been the ability to custom create cakes and truffles for people with various dietary restrictions. What started as a mere idea has taken a turn for good and I am enjoying spreading happiness, one chocolate at a time...... Creating gluten free, egg free, dairy free, nut free desserts without compromising on the taste and quality of the product. 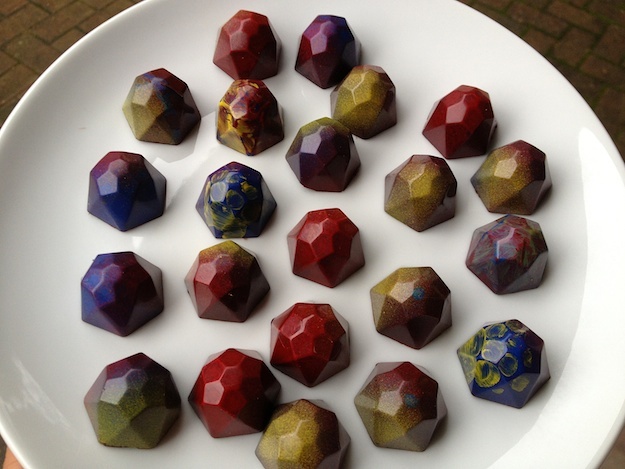 Aarti Khosla and her boldly delicious handmade chocolates. When it comes to handmade chocolates, Aarti Khosla of Weston, Connecticut doesn’t just talk the talk, she walks the walk. Taking a break from her marketing career to raise her family, she decided to pursue a passion she could do at home — make chocolates. But she didn’t just order generic Wilton lollipop molds and “chocolatey” melts to create simplistic run of the mill confections. She decided to do things right and make delicious, as well as artistically beautiful, chocolate creations. 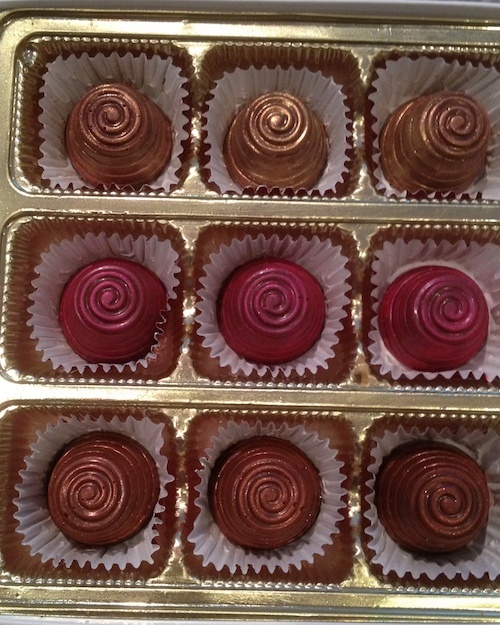 A sampler of truffles by Le Rouge. First off, she knew she needed to learn more about chocolate making in order to be good at it, so she took online classes with Ecole Chocolat and earned the designation as a certified chocolatier. She attended chocolate expos to learn about the business side of chocolate making, and practiced her skills, bringing homemade caramel coconut chocolates to church dinners and entering orange nut clusters in the local grange fair. She listened to people as they tried her candy to see what they liked and what they didn’t like. 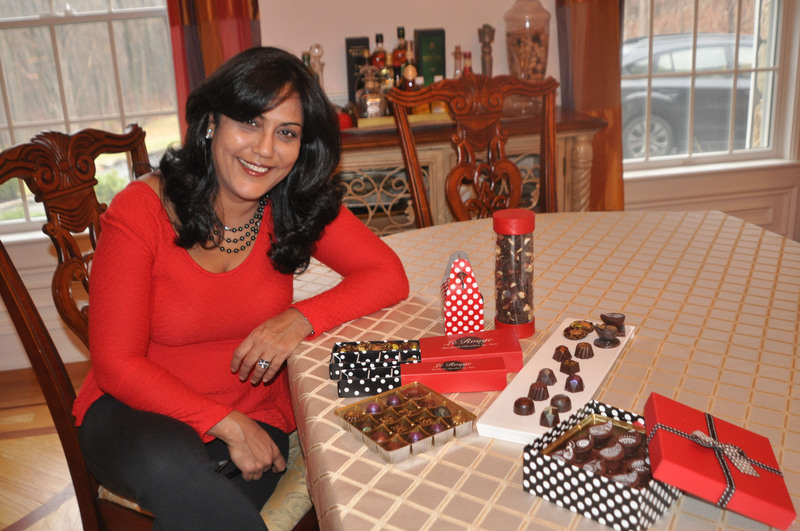 Within one year from her initial decision to make chocolates at home she was ready to turn her passion into a full-fledged business, and came up with a name for her company: Le Rouge – Handmade Chocolates by Aarti, based on her love of the color red. One of Le Rouge’s fanciful chocolate mendiants features a pistachio, almond, and cranberry, dusted with gold sugar. A one-woman show, she handpicked special boxes and packaging for her products, and makes all the chocolates herself in small batches at a local commercial kitchen in strict accordance with department of health guidelines. She uses the finest fair trade Belgian chocolate she can find and all-natural ingredients for the fillings. In a final touch, she decided to be true to her Indian and worldly roots and makes chocolates with bold flavors such as intense raspberry, pistachio and saffron, masala chai, halva heaven, and serious caffeine fix. Le Rouge is quickly developing a following, pretty much by word of mouth. That word spreads quickly by the way, after you pop one of Aarti’s chocolates in your mouth – they’re that good. I recently interviewed Aarti for a story for our local newspaper, so naturally, I had to take one for the team and try a few chocolates – for research purposes of course. The truffles had a smooth finish, which I liked, and the flavors were identifiable with my eyes closed. I didn’t need to see the Irish ale truffle to know what it was, the beer taste was clear. And much to my surprise I really liked it. English toffee was crisp and buttery, and orange almond clusters were surprisingly light and crunchy. I think those were my favorite. While Aarti makes safe choices for those not into bold flavors, she also goes extreme with wasabi ginger and Sichuan pepper truffles. But truth be told, even they were enjoyable. I didn’t go running for a glass of water after trying them. Visit http://www.lerougebyaarti.com for more information and to order Aaarti Khosla’s artsy handmade chocolates. Aarti and a chocolate menorah she made for the holidays. 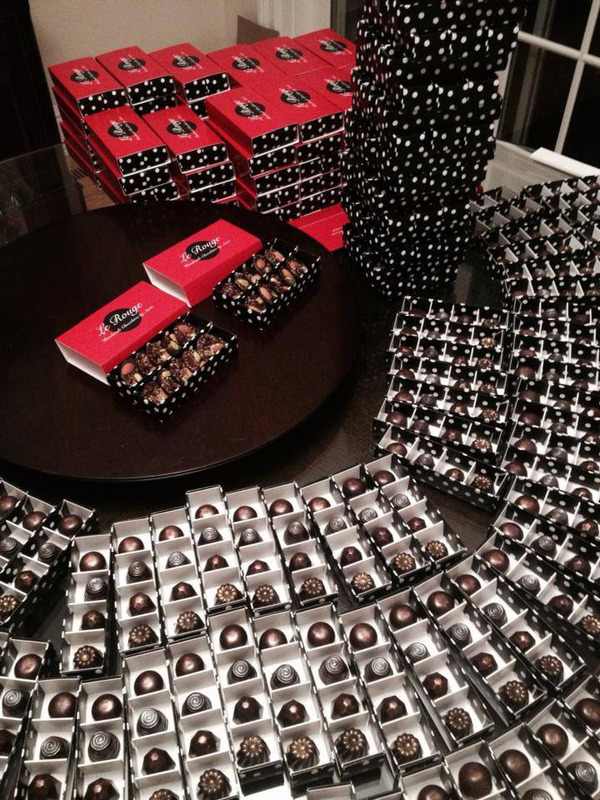 A cascade of beautiful Le Rouge chocolate party favors. The handmade chocolates of LeRouge are some of the most unique around, and the woman behind it is just as noteworthy. Founder Aarti Khosla of Weston, CT gathers inspiration from cultures she’s encountered near and far and in turn infuses her chocolates with both exotic flavor combinations, including saffron & pistachio, and beetle leaves & preserved rose petals, as well as more familiar ones like double espresso & dark chocolate, and apple pie & cinnamon. All of her chocolate varieties are made with vegan fair trade dark chocolate and can be made completely non-dairy (the dairy only comes in when she adds white chocolate for a ganache in some flavors). A lifelong travel, food, and of course, chocolate aficionada, Aarti experimented with various recipes and mixtures until she found the perfect balance of flavors to delight local folks with “global palates"
She has now mastered several varieties and makes all of them in small batches by hand. Her handmade chocolate collections are not only distinctly tasty, they are visually appealing as well. 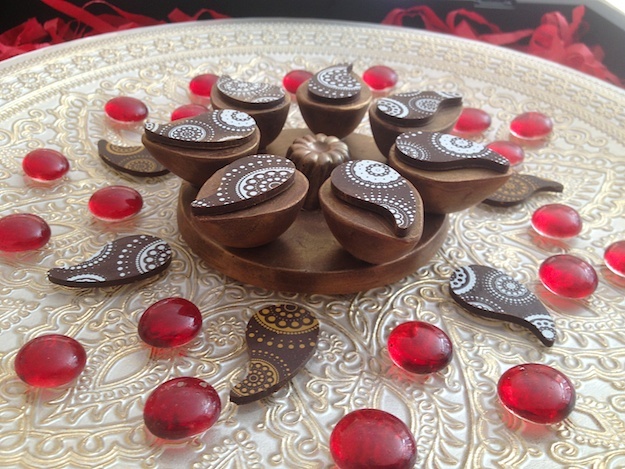 Check out the ‘glowing’ masala chai and wasabi ginger truffles and her limited edition chocolate Diya to get an idea. You can get her chocolates directly from her website, and be sure to follow her on facebook to get updates on new varieties and events. Aarti Khosla doesn’t do anything quiet or small. So when she started a handmade chocolate business, she decided to make truffles and molded chocolates with bold flavors, such as intense raspberry, pistachio and saffron, Irish ale, Sichuan pepper, and wasabi ginger. “When it comes to making chocolates, I like the idea of bringing a little bit of the world back home,” Ms. Khosla said in an interview at her Weston home. Dusted with intense colors, Ms. Khosla’s handmade chocolates are as interesting and beautiful as those produced by such renowned chocolatiers as Norman Love. So it’s hard to believe Ms. Khosla has been making chocolates for just one year. 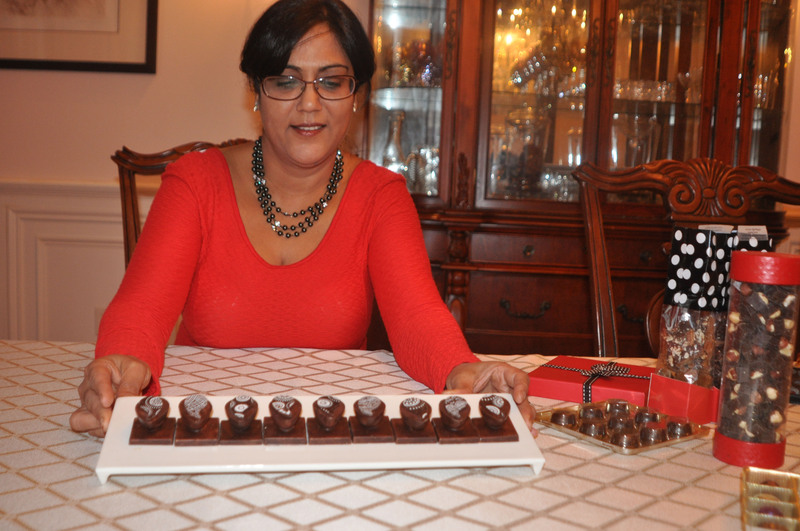 Her chocolate business is called Le Rouge — Handmade Chocolates by Aarti. Rouge, the French word for red, is her favorite color. Ms. Khosla’s taste for exotic flavors stems from her Indian background (she was born in New Delhi) and her travels around the world. She is always on the go. Although she and her husband, Inder, and children, Anisha and Rishav, moved to Weston in 2009, the family spent two of the past few years living in Hong Kong. Now firmly back in Weston, Ms. Khosla, a former financial service representative with the Barnum Group and buyer at J.C. Penney, found herself in the unusual position of having time on her hands. “I was so used to traveling that when we got back from Hong Kong, it seemed so quiet here,” she said. Opting to stay home and tend to her children as they wend their way through the school years, Ms. Khosla also felt the need to take up a hobby. “I love cooking, so I decided to do something I loved. For me, cooking has always been my sanity factor, it’s my passion,” she said. She particularly enjoys desserts, but Indian desserts are often very sweet for her taste. So she got the idea to create a line of handmade chocolates using the finest ingredients and not just full of sugar. A cascade of Le Rouge chocolate party favors. “I have a quest for perfection. So I thought, If I were looking for the perfect gift what would I go for? Chocolates!” she said. But making fine chocolate takes a lot of skill and is not for the faint of heart, so Ms. Khosla spent more than 200 hours taking online classes through Ecole Chocolat to earn the designation as a certified chocolatier. She even traveled to Vancouver to learn about chocolate coloring from a master chocolatier. With a culinary education under her belt, Ms. Khosla quickly turned her hobby into a business. She found a commercial kitchen in Weston available for her use and set out to make chocolates. “There was a bit of a learning curve at first,” she admitted. One of her initial attempts was to make raspberry truffles. But the filling was too liquidy for the chocolate shell and it quickly seeped out. She adapted the recipe by creating a soft raspberry caramel for her Intense Raspberry Truffle — so problem solved. Ms. Khosla uses the finest ingredients she can find for her chocolates and uses only fair trade vegan Belgian chocolate, and organic and local ingredients for the fillings. She pays close attention to every detail about her chocolate business and spent a long time choosing just the right packaging and bright red boxes for her chocolates. “The first boxes I chose weren’t red enough. The ones I’m using now are just right,” she said. To get a feel for the business, Ms. Khosla has attended Chocolate World Expos at the Maritime Aquarium in Norwalk and on Long Island, and has displayed her wares at farmers’ markets in Westport, New Canaan and Redding. At the Norfield Grange Fair in September, her English toffee and orange-infused almond clusters were awarded first-prize blue ribbons. 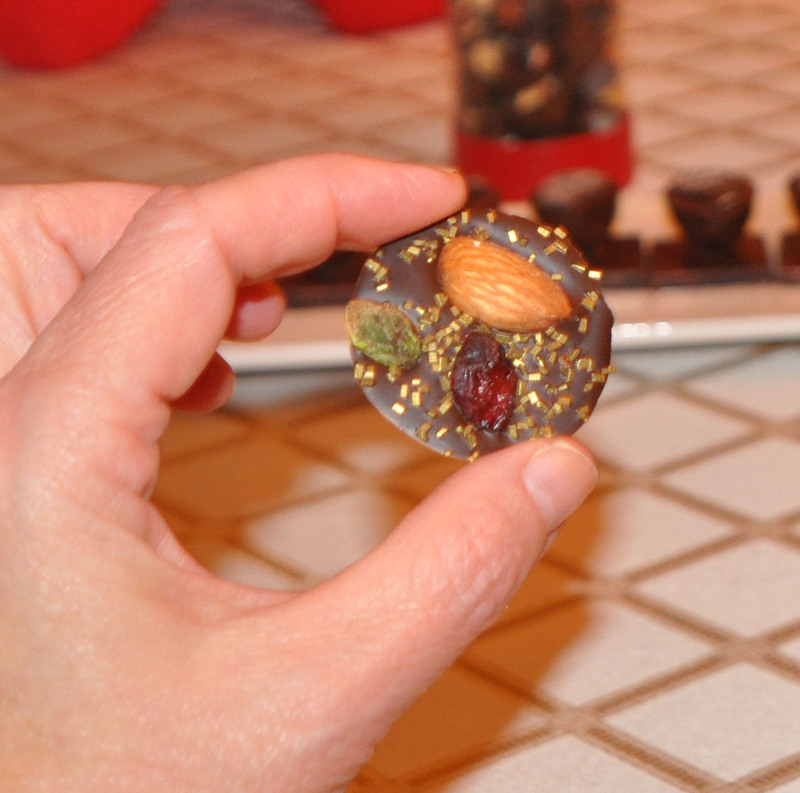 She makes all her chocolates in small batches and sells them online through mail order. Her confections have also been featured as favors for weddings and corporate events. • Intense Raspberry, raspberry-infused soft caramel. • Ale Truffles, Irish ale-flavored ganache. • Serious Caffeine Fix, espresso-infused ganache. • Apple Pie à la Mode, apples with cream. • Guava Chili Mango, fruity with a kick of heat. • Sizzling Sichuan, dark chocolate with the intense heat of Sichuan peppers. • Masala Chai, chai with hints of cardamom and cinnamon. • Halva Heaven, halva and saffron-infused ganache. • Kesar Pista Delight, pistachio and saffron. • Wasabi Ginger, wasabi-infused ganache with candied ginger. • Paan Bahaar, beetle leaves and preserved rose petals in fennel-infused dark chocolate. In addition to truffles and molded chocolates, she makes her award-winning English toffee and orange-infused almond clusters, as well as Mendiants — chocolate disks featuring almonds, pistachios and dried cranberries, and sprinkled with gold sugar. For those wanting just a nibble of fine chocolate, she makes tiny chocolate squares studded with a single hazelnut or almond. She has also made special limited-edition chocolate confections, including a chocolate menorah for Hanukah and a chocolate diya lamp for the Indian holiday Diwali. While most of her confections are covered in dark chocolate, Ms. Khosla is flexible, and customers may order milk or white chocolate if they prefer. She’s also open to ideas and suggestions for new flavors. “These are the perfect chocolates for those who enjoy the finer things in life,” she said. 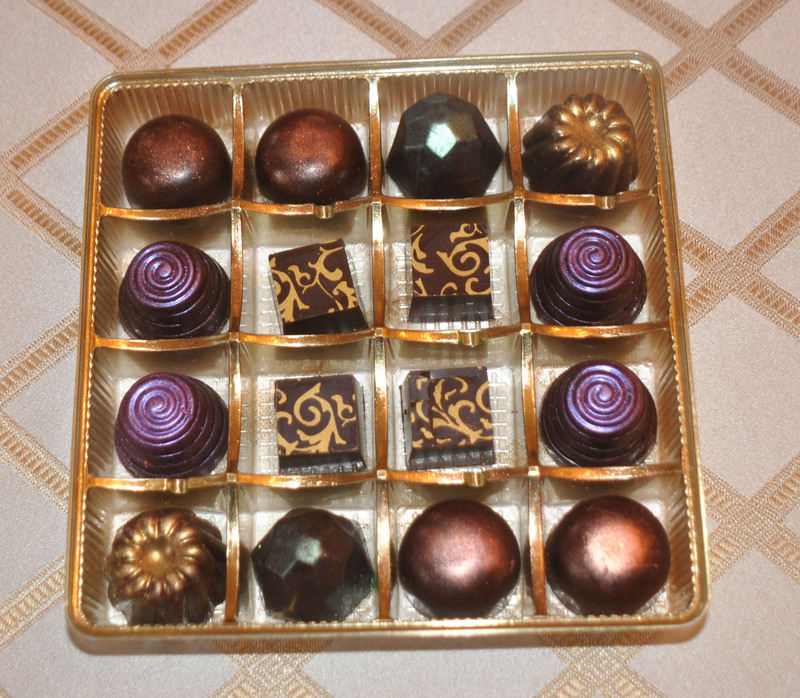 To purchase Ms. Khosla’s chocolates, visit her website, lerougebyaarti.com or her Facebook page, Le Rouge-Handmade Chocolates by Aarti, or call 203-293-6106. Let me begin by thanking all my friends, family and acquaintances for believing in my dream and walking with me to make Le Rouge a reality. The journey would not have been possible without your support. I will be at the West Elm Farmer's Market in Westport this Saturday... stop by if you are in the area.